This page is devoted to questions about the Franklin engines. Both the -B8F and -B9F will be listed here. If you need manuals you can get them here. All questions will be listed forever; answered or not. In regard to Jaren's switch; The common mag switch is made to open the circuit to unground a magneto and allow it to operate. Jaren needs a switch that closes the circuit and allows power to flow to the coil on the distributor side and opens the circuit on magneto side to unground the mag. I can't think of a way to make a Gerdes or ACS mag switch do this. Thanks to member Terry Matthews! 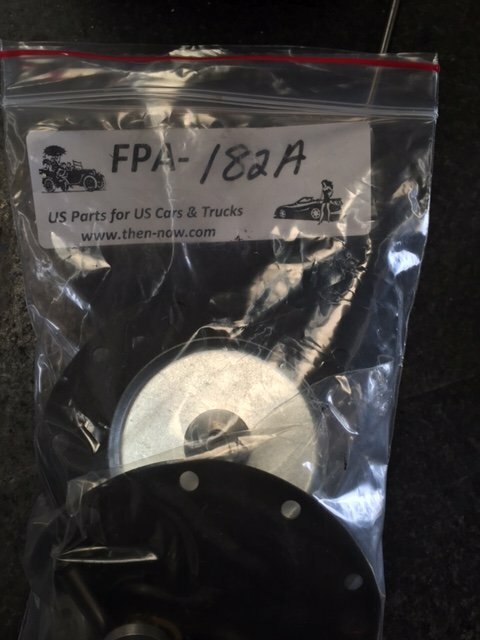 Tom Danaher has an inquiry about material for Franklin fuel pump diaphragms. A company called Rubber Sheet Roll (info@rubbersheetroll.com) of Shippensburg, PA, has fablic reenforced neprene available in 12" X 12" sheets .062 thick for $17.71. "Our Franklin fuel pump problems are over! Thanks to Walter Windus, who discovered a source of overhaul kits with all new parts, including the critical oil seal. It's a company that specializes in parts for old cars and evidently there's one that uses the same fuel pump as (our) the Franklin. The kits are $44.50 each plus shipping as of November, 2011. The kit part number is the same as the attahced picture. Disassembly of these fuel pumps is tricky so I have made up a set of instructons, also attached. I'm sure all you Franklin guys are happy to see this! Thanks JR! It was Walter Windus who discovered (or rediscovered) the source of the repair kits, not me. I've just been on the phone with Rich Brumm. He said he's used these repair kits before and had bad luck with them. In one case the end of the diaphragm plunger broke off, and most of them start to leak after 100 hours or so. The kits he used did not have the "-A" on the part number, so they might or might not be improved. What is the differences between the B8F and the B9F? Which is preferred? Can anyone discuss their experiences with either of these engines? I am no expert (yes he is. SM)...this is just info I found in a variety of literature. Update! It comes form a very reliable source that the -B8F had a smaller gear drive for the magnetos that caused a few engine failures caused by this gear failure. Both mags quit and then, of course, the engine quits. He says the -B8F is very unreliable. Aircooled motors also changed the valve train system in the later -B9F. "My name is Tom Danaher and I own SeaBee S/N 150, N191VW. I purchased it in 1959 at Portage, Wisconsin. It is stock throughout. Still flys good with a B8F Franklin. I need some fuel pump lower diaphragms. I have been making them from stock neoprene sheet but they begin leaking in 30 or 40 hours. Can you tell me of any source for these small (about 1-1/2") diaphragms? Would appreciate your help very much. Thanks. Hi Tom. Congrats on the new Bee. The diaphragms that you talk about sound smaller than the ones on my Bee, but maybe not as I am not near the Bee right now. I bought up a bunch of old carbs at an auto parts store some years ago and used the diaphragms out of some of them, but there are probably not many of those left. I would recommend Rich Brumm, brummrichkaren@aol.com , who overhauls Franklins and their parts. 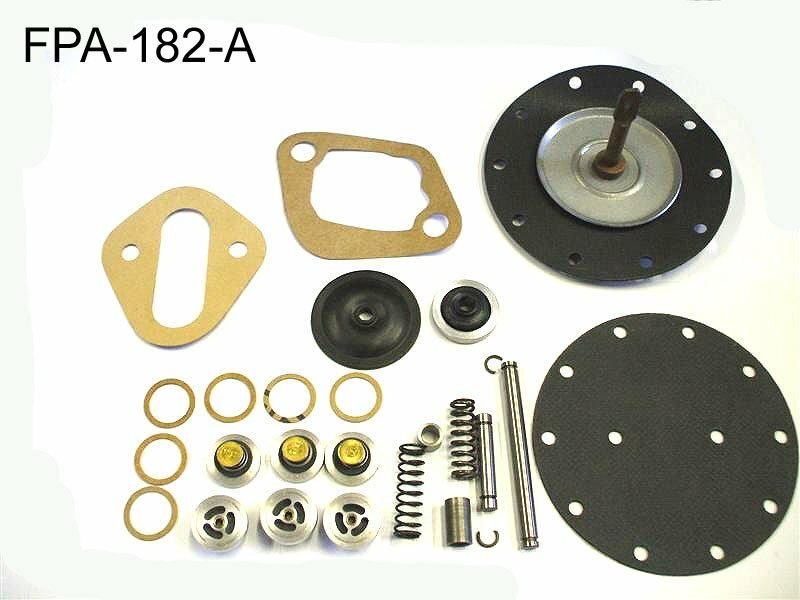 Tom Danaher has an inquiry about material for Franklin fuel pump diaphragms. A company called Rubber Sheet Roll (info@rubbersheetroll.com) of Shippensburg, PA, has fablic reenforced neoprene available in 12" X 12" sheets .062 thick for $17.71. Does any franklin engine owner know where I can locate a parts manual, overhaul manual, or sevice manual for the autolite distributor used on the B-9F engine.? I'm hoping you may have a lead for me that would help get my vintage 1947 Seabee airborne again. I have been grounded by that pesky Airworthiness directive on the propeller. The blades are good but one clamp has a bit of corrosion and I need at least a new clamp if not a replacement propeller. I know many operating Seabees have had engine conversions to newer Lycoming and other engines. I'm looking for those propellers and clamps that were taken out of service when those new engines were installed. I have a Franklin 215-B9F (215 HP) engine (standard stock engine) in good running condition. The Seabee and engine are completely operational. The prop blades are good as well. However, the required AD procedure on the prop reveals a very minor amount of corrosion on one of the propeller CLAMPS. If I could get a single clamp, that would be perfect. My clamps and prop blades are off in a prop shop so I can't go and get all their numbers. I'd certainly appreciate any leads or suggestions you might have or, if you have a serviceable prop clamp that fits my prop, or, if you can locate one, we deffinitely can do business! Hey there guys, just to let you know I am a aircraft maint engineer (canada) who has been restoring a seabee for an Air Canada pilot (Tom Stockdill) for the past 2 years (part time). I can't remember the serial number of hand but believe it to be around 1000. I've enjoyed working on this remarkable aircraft immensely, and we hope to have it flying in the summer (2003). This aircraft has not flown for 6 years and was in pretty rough shape when we started the re-construction. We had the original Franklin engine re-built, and have completed some upgrades; electronic fuel qty indication, VOR, replaced fuses with curcuit breakers, cleveland brakes, eng oil filtration system, etc. If you have any information in regards to the rigging of the prop control I would appreciate it as all the info I have on hand is pretty ambiguous. Hello James, congratulations of bringing back another Bee. The Prop control is not that hard to adjust if the prop itself is set up properly from the prop shop. The stop for the prop control, (not the Reverser control), should be set to allow a static rpm of 2300 to 2350. This is done by having the reversing control against it's stop,(full forward), and adjusting the stop bolt for the main prop control. An easy way to do this is to set it high, do a full power run up using the prop control to limit the rpm to 2300, then after shutting down, adjust the stop to the position of the prop control. Once it is set, while running at 1000 rpm, SLOWLY move the reverse control back to full while someone watches from the side. If the clamps are not set properly, the bolt heads on the clamps will hit the valve when in full reverse. If this does happen, it is legal to grind a taper in the bolt head as long as long as you only grind the wrench grip portion, not the tapered shank. During the take off, the rpm will increase to over 2500 (red line) and it should be brought back down a couple of turns to the red line. This is just procedure for every take off. If you have any questions, Let me know. Good Luck! I have some info on prop settings. Please give me your fax and I will send them to you. I have been corresponding with a gentleman about a Seabee, turns out it has no prop. I see another Seabee on your web site for sale and owner can't get or afford a prop?! Question is, what prop(s) can go on the Seabee with the Franklin model 6A8-215-B8F engine, and what sort of price should one expect to have to pay ? A new Hartzell prop goes for around $15 or $16K. They are a different blade and clamp design than the older Hartzell props and have no AD. There are a number of "old design" props that are around for substantially less money, but have the AD with them. The AD is a 5 year inspection, and may require new clamps. I don't know if Hartzell still makes the old clamps or not. The old props work just as well as the new ones, (some say better due to the hardness of the blades). Just be sure it passes the AD before you buy one. Also, Hartzell doesn't make the hydraulic part of the prop anymore, piston, cylinder, valve, etc. They only make new props down to the jack plate. The good news is that there are usually a lot of hydraulic parts around. Does anyone else have a copy of the Form 337 for the oil filter installation, not the Airwolf Lycoming one but the other. Does anyone else have the problem of the cowl latches falling into the way as you try to close the cowl? My solution is: A drop of super glue on the latch pin stiffens up the movement just enough to keep them from falling in the way as I close the cowl. Easy and inexpensive! I use the gap filling super glue and kicker purchased from local hobby store.